Whether its power-to-weight or power and control, the KTM 250 SX is the perfect combination of all that counts. Featuring the latest high-performance 2-stroke engine fitted within a state-of-the-art chassis, this powerhouse is undoubtedly the fastest 250cc 2-stroke on track. This proven race weapon is the right choice for those who thrive on that glorious 2-stroke sound while smashing out one hot lap after the next. BODYWORK & GRAPHICS: The KTM 250 SX has become an icon amongst 2-stroke fanatics, but for this bike, the classic sound it produces is where the nostalgia ends. A combined effort between KTM's factory riders, KTM R&D and Kiska Design has resulted in a highly effective modern-looking motorcycle with bodywork that achieves complete harmony between rider and bike. When designing the 2019 SX range, the main goal was to provide the perfect contact points for the rider, allowing maximum freedom of movement and improved motorcycle control. Examples of the intelligent design can be seen in the Ibeam structure of the front and rear fenders, which guarantee maximum stability and the lowest possible weight. The modern design and graphics ensure that it is not only about function, but an impressively fast and aggressive look that sends a clear message to the competition. DECALS: New graphics convey the READY TO RACE character of the 2017 SX model line. CHASSIS: The chassis forms an integral part of the feeling a rider has with his bike. The new chassis on the KTM 250 SX is designed to provide accurate feedback between the track and the rider, while also reducing the harshness of typical motocross terrain. The new lightweight, high-tech steel frame is made from chrome-moly and features optimized flex characteristics that soak up those big hits while also delivering excellent agility and high-speed stability. For 2019, the engine has been raised in the frame by 1° around the swing arm pivot, improving the handling and the grip of the front wheel. The refinements on this new chassis ensure the KTM 250 SX remains one of the most thrilling rides out there. ENGINE & EXHAUST: The engine of the KTM 250 SX features the latest 2-stroke technology with a counter-balance shaft for low engine vibration, as well as a reliable hydraulically operated DDS clutch. 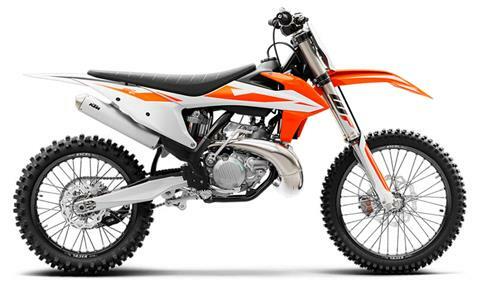 It has a twin-valve controlled-power-valve, which is a major factor in making the KTM 250 SX engine the most competitive 2-stroke in its class. Further refinements to the cylinder and exhaust, make powering through its 5-speed transmission a truly exhilarating experience. CYLINDER: The newly developed cylinder of the 250 SX - with a bore of 66.4mm - has all-new ports and is fitted with an overhauled power valve system. This system features a sophisticated mechanism for the lateral support exhaust ports, providing smooth and controllable power on tap. Furthermore, it’s possible to change the bike’s power delivery in seconds thanks to two supplied powervalve springs. Limitless settings for different tracks and preferences are up for grabs. Throw everything you have at it; new water jackets in the cylinder and head will take care of excess heat and reworked lateral cylinder head brackets allow a more efficient fixation of the engine to the frame via lightweight head stays. Yes, this is a serious piece of kit. CRANKCASES AND ENGINE COVERS: These all-new die-cast engine cases feature an 4mm higher clutch shaft and a 19.5mm higher crankshaft, resulting in better mass centralization and quicker handling. In addition, it allows the implementation of a counter balance shaft. So your ride will be as relaxed as it is rapid. Plus, your new favorite engine will keep looking as fresh as the day you bought it with redesigned engine covers featuring a smart surface structure in order to reduce the wear caused by the rider’s boots. TRANSMISSION: A robust 5-speed transmission, its gear ratios perfectly in sync with the 250’s power band. An advanced ´No Dirt´ gear shift lever design prevents mud and sand from jamming the joint of the lever and guarantees trouble-free shifting. CLUTCH: The 250 SX employs the KTM-developed DDS clutch (damped diaphragm steel) with a wear-free steel basket and extremely heat resistant clutch plates. This clever design employs a diaphragm spring instead of the usual coil springs, making for considerably easier clutch action. A diaphragm spring also leaves sufficient space for a damping system to be integrated into the clutch hub. The goal is traction, but durability is as well. A lighter basket, a reworked inner hub and a pressure plate providing better oil supply and unsurpassed cooling up the longevity of the DDS clutch. Light operation and telepathic amounts of control are standard with this hydraulic Brembo actuated clutch. CARBURETOR: The KTM 250 SX is fitted with a MIKUNI TMX carburetor. This 38mm flat slide carb lives to provide smooth and controllable power all the way up to the rev limitation. With a new intake manifold the carburetor is turned 7° in order to reduce the overflow of fuel. And it’s less sensitive to different altitudes and temperatures, so you can pin it wherever, whenever. IGNITION: Its 72mm stroke is the same, the rest is brand new. The 250 SX’s crank has been rebalanced, revamped and set-up with a counter balance shaft to kill vibrations, not your vibe. CRANKSHAFT: This reliable piece of engineering has been skillfully balanced to guarantee minimal vibrations. In its latest form, it allows a decrease of the displacement to 125cm3 just by replacing cylinder, piston and head. There’s no longer the need to change the crankshaft if you want to change displacement. Two-in-one in no time. ERGONOMICS & COMFORT: A rider's ability to work in unison with his bike depends on how quickly and effectively he can shift his weight around the motorcycle. KTM has focused extensively on creating bodywork and ergonomics that allow for the highest levels of performance. This ensures the natural riding position offers the best possible control and, through various handlebar positions, can also be adjusted to suit every rider and condition. A rider's main connection to the motorcycle comes through the seat, footpegs and handlebars and these three touch points play a vital role in maintaining balance and control. A rider is always looking for a fast and competitive motorcycle with a great feeling of controlled agility. The 2019 KTM 250 SX, like the entire SX range, ticks all the right boxes, especially when it comes to race-ready ergonomics. HANDLEBAR: KTM engineers sure know how to handle handlebars. This tapered one, made of high-strength aluminum by NEKEN, is fixed in damped rubber mounts and has two different positions. From 2017 onwards, the lower handlebar clamps are separated, while on the upper side a new bridge-type clamp guarantees more torsional stiffness. It’s also easier to replace the bar in case it gets twisted in a nasty crash. ODI lock-on grips make grip changes easy which does not require any wire or glue to be secured. SOFTWARE & ELECTRONICS: Absolute performance purity is the name of the game when it comes to electronics and the new KTM 250 SX. Undiluted 2-stroke simplicity, with an hour meter to keep a check on how long you've been shredding and an optional rev counter to assist with perfect setup.